Once trained, Standardized Patient Instructors will simulate medical symptoms while being examined by LAU med students to help them practice. 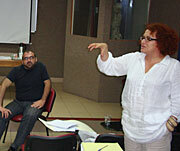 Dr. Nadia Asmar gives instructions during a practice patient–doctor simulation between two SPIs. 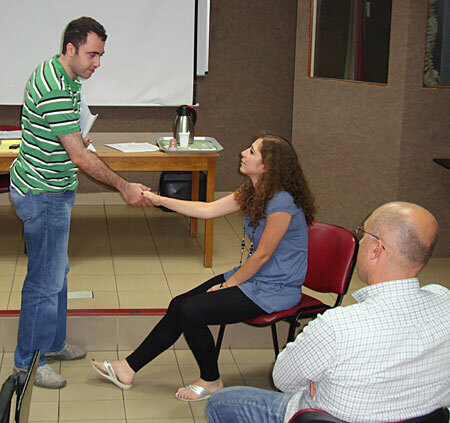 Dr. Lina Abyad offers SPIs acting tips during an October 13 training session at the University Medical Center – Rizk Hospital. SPIs observe a practice simulation during a training session. Two SPIs act as a medical student (standing) and patient during a practice simulation. A team of 10 volunteers have been training at the University Medical Center – Rizk Hospital since September as part of the LAU medical school’s Standardized Patient Instructor program, the first of its kind in Lebanon, designed to simulate doctor-patient scenarios and help medical students practice. Once prepared, SPIs will act out medical symptoms or problems while LAU med students interview and examine them in rooms resembling doctors’ offices. The goal is to create a realistic medical examination that will help students enhance their clinical and communication skills. ”SPIs are a concrete expression of the commitment of the School of Medicine to instruct our students in the art of caring for, communicating effectively with, and getting to understand deeply the patients whom they will encounter as future doctors,” says Dr. Kamal Badr, LAUMS founding dean who initiated the program. The initiative “is also in fulfillment of our goals to deliver the very latest and best methods of instruction in our unique curriculum and is in phase with the modern trends in medical education for early clinical exposure and emphasis on communication skills — caring for the patient and not just the disease,” Badr adds. SPI-training sessions will continue throughout the academic year. During that time, SPIs will conduct six sets of simulations with the students, one at the end of each of the medical school’s five modules, plus a final simulation exam at the end of the year. The first simulation will take place next month. The search for SPIs began on September 16 when Badr sent an email to LAU community members announcing that the medical school was seeking individuals interested in spending 8–10 hours each month simulating patients. Responses immediately began pouring in from students, alumni, faculty and other LAU community members. 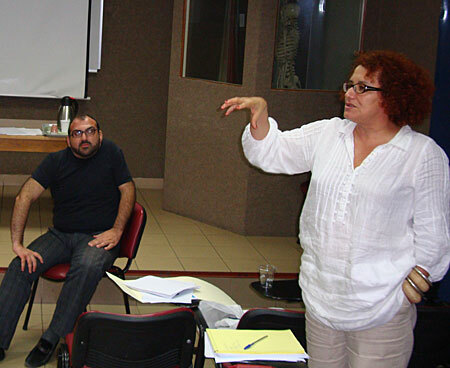 “We were really overwhelmed by the number of emails from people asking to be standardized patients, although our target was only 10,” says Dr. Nadia Asmar, an LAUMS faculty member who is training SPIs along with Dr. Lina Abyad, assistant professor at LAU’s Department of Communication Arts. Asmar deals primarily with the medical aspects of the training, while Abyad helps SPIs develop their acting skills. “I think it’s very interesting to play around with words so [the medical student] will have to push and ask for more details,” Abyad explained to a group of SPIs following a practice simulation during an October 13 training session. Both Asmar and Abyad traveled to Boston in August for a one-week training session to prepare themselves for the program with University of Massachusetts experts who tailored special courses for them. 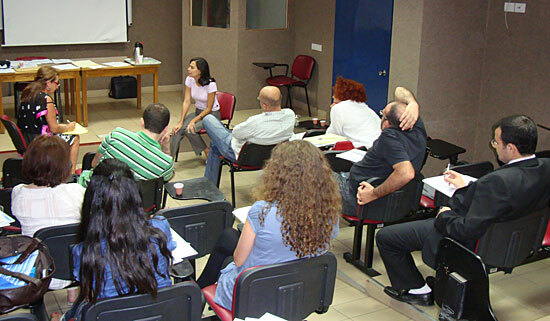 While the program is new to Lebanon, SPIs are regularly used by medical schools in the United States and Europe. “I think we need the program here in Lebanon,” says Nermine Mufti Hage, an LAU English instructor of 15 years who is one of the 10 SPIs.